The Lantern Festival is celebrated on the 15th day of the Chinese New Year. It marks the final day of the traditional Chinese New Year celebrations and falls on today (February 11th) this year (2017). The Lantern Festival is traditionally celebrated with gorgeous lanterns, clever lantern riddles, festive lion dances, and little glutinous rice balls called tang yuan. The round shape of the rice balls is the same as the full moon of the Lantern Festival. It also symbolises family togetherness and unity. That’s why they are also served at festivals or family celebrations. But nowadays, they have become a popular dessert that can be eaten any time of the year. Tang yuan literally means “soup circle”. 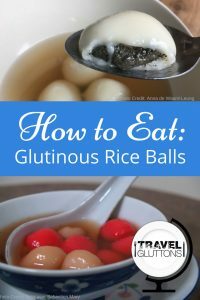 The white skin of the rice balls is made from mixing glutinous rice flour with a bit of water, which gives the skin its chewy texture. The rice balls are traditionally stuffed with sweet fillings, such as black sesame, red bean or peanut paste. Frozen glutinous rice balls can be easily found at Asian supermarkets, but many families still make them at home. When I was small, I used to make these rice balls with my nanny. My job was to roll the filling into small marble sized balls and the white dough into bigger ones like ping pong balls. Then my nanny would flatten the white dough balls into a circle, add the filling ball to the centre, skilfully close the dough over the filling, and roll it into a perfect round ball. The cooked rice balls are really soft. A Chinese spoon should be used as it perfectly cradles a rice ball and still has enough room for some liquid that it’s served in. Don’t just pop (or slurp) a whole rice ball into your mouth as the piping hot filling will burn your throat and its incredibly sticky texture makes it a choking hazard. 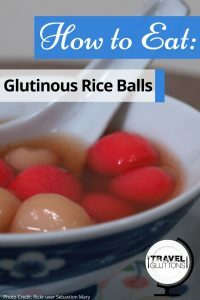 The best way to enjoy a glutinous rice ball is by slowly sinking your teeth into it, so you have a good mixture of the bland skin and sweet filling in one bite. Enjoy the contrasting textures of the smooth, chewy skin and the runny, lava-like filling. In its simplest form, the rice balls are served in a ginger broth made from simmering water, ginger pieces, and brown sugar. The ginger broth is usually not too sweet. The flavours of the sweet filling and the warm ginger complement each other perfectly. 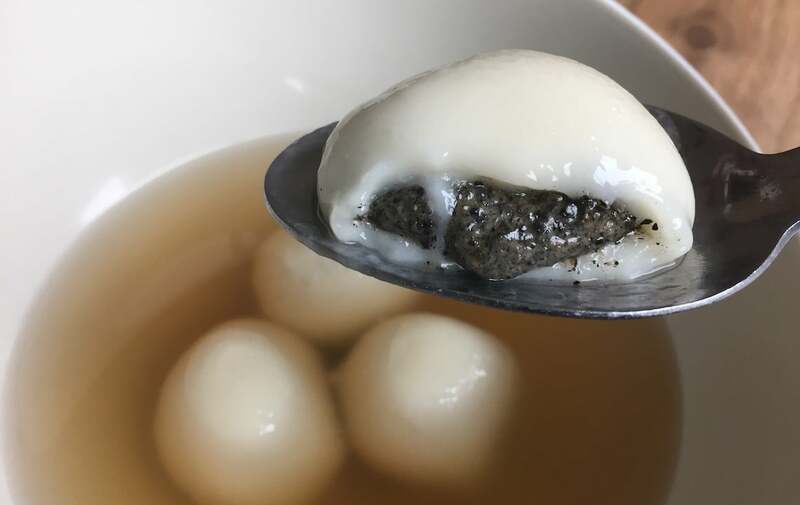 But it is also common to serve the rice balls in a Chinese sweet soup, such as black sesame soup or red bean soup. Most Hong Kong people prefer their glutinous rice balls with a sweet filling. But people from some parts of China may argue that their savoury rice balls filled with a meat mixture are better. If you like tang yuan, you would like another popular dessert in Hong Kong called tong but luck too. It’s basically unfilled glutinous rice balls coated with crushed peanuts and roasted sesame seeds. 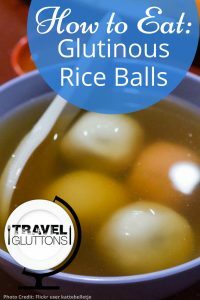 I grew up with glutinous rice balls that are white, about the size of a ping pong ball, and with sweet filling. It was a pleasant surprise to find smaller, more colourful, unfilled rice balls – called kuih ee – when I visited Malaysia. Here’s a short video to show you how to make your own glutinous rice balls with a black sesame filling.